In case you hadn’t noticed, The Legal Genealogist is a law geek. Or the Supreme Court decision in Houston v. Moore3 on state control of the militia, or Crandall v. Nevada,4 on the right of the federal government to transport troops through a state without paying a passenger tax. Yep, The Legal Genealogist is off down a rabbit hole of military law. And there are some great reference sources out there if you need to know more. 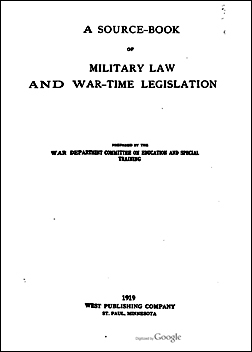 The book was originally prepared for use in law schools to train future military lawyers, and it includes materials on the law both in war-time and outside of war. Things like that mutiny act, and the Constitution, and the statutes. Like case law and regulations. So it may seem like it’s just a bit too much on the geeky side for genealogists. But there’s an awful lot of history, and even personal or family history, to be found in those pages. Think about how important it might be to understand the laws on enlisting minors in military service. Who was too young to be enlisted. Who needed parental consent. The fact that a felony conviction might disqualify a recruit. Think about an ancestor who might have been involved in supplying horses to the cavalry. There was a whole U.S. Supreme Court case on a change in the rules on cavalry horses called In re Smoot’s Case — and it could have impacted one of our families. Think about the family members who wanted to get into the fight in World War I before the United States entered the war. What were the laws and regulations and rules on enlisting in the service of a foreign nation? And what about a soldier who was hurt in a car accident while on leave or even while on duty? Could he sue the civilian driver of the other vehicle? And what happened to the personal effects of a soldier who was killed or died in service? These are just a few of the matters covered in this 858-page digitized volume. The laws of war, like any laws affecting our ancestors, are things we have to consider at the time and in the place where our ancestors were found and in which they created records. Great post! Having my life governed by the Uniform Code of Military Justice for 31 years and participating in many courts-martial I learned a lot about how this system works. Look for your ancestor’s records in the National Archives to see if he was court martialed. Did you know that in the Civil War all of the files of those sentenced to death were signed by A. Lincoln. One way to get a president’s signature in your genealogy.